Here at Little Poppets Nursery we would class ourselves as one of the best local childcare providers in Leicester due to the professional service that we provide to not only the children in our care but also to their parents. Having been around since 1989 we are well established and the fact that we are open from 7.15 am up until 6 pm can only help parents who have to work either earlier or later. Since opening our doors in 1989 we have looked after many children, nurturing them and helping them to achieve their potential. Parents comment positively on the level of commitment and hard work of our staff who take great care of the children at our facility. Some of these parents recommend us to others and also use us again for other children because they know that we are one of the best local childcare providers in Leicester. Parents have a hard choice to make when it comes to finding childcare for their child or children, we understand this and the fact that they will want the very best around. At our nursery we provide a warm, safe and stimulating environment where children have the freedom to learn and develop well all round in all areas. 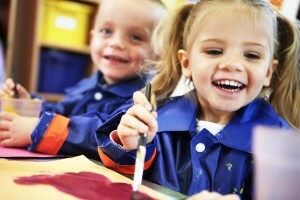 Our staff encourage the children to develop at their own pace and plan activities to help with the children’s learning. So, if you are looking for the best childcare provider in Leicester why not get in touch with us today and arrange to come and see around our nursery.